1. 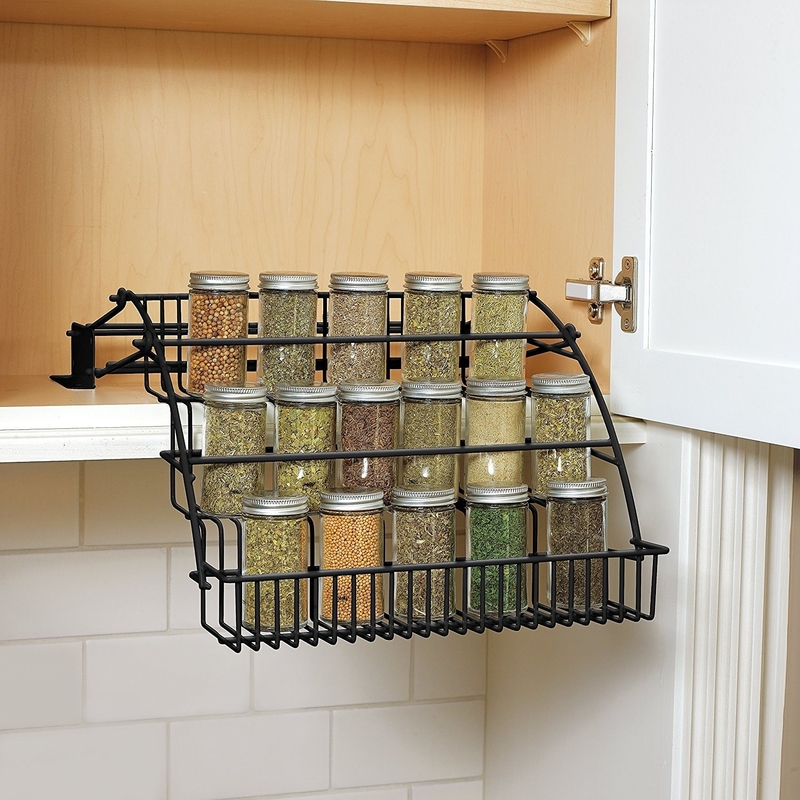 A roll-out lid organizer so you can contain your soup without digging in your lower kitchen cabinets OR throwing out your back. Win-win! Holds up to 18 pan lids while also holding trays, baking sheets, and cutting boards. Made of 99 percent steel, easily installs, and measures 7.25"x9"x21". Get it from Amazon for $47.01. 2. Or a shelf duo that'll become the envy of the neighborhood. 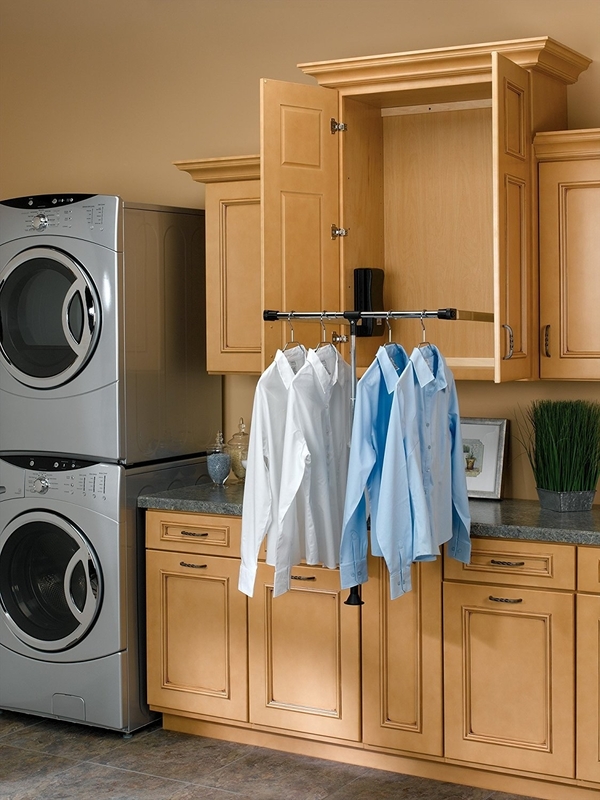 Designed for a cabinet that is 15" width (B15) from outside to outside, with a 11-1/2" or wider opening, requires a 11-1/2" or larger cabinet opening to work properly, has a 100 lbs. full-extension ball-bearing slide system, and mounts on bottom, side and rear for total stability. Get it from Amazon for $81.61+ (available in four sizes). 3. 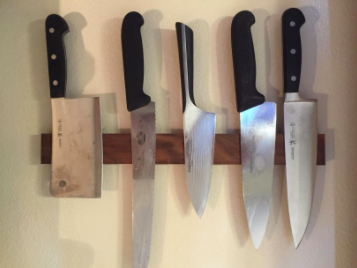 A pull-down closet rod to gain a lil' extra storage space in those tippy-toppy cabinets — minus precariously balancing on a step stool to reach the contents. 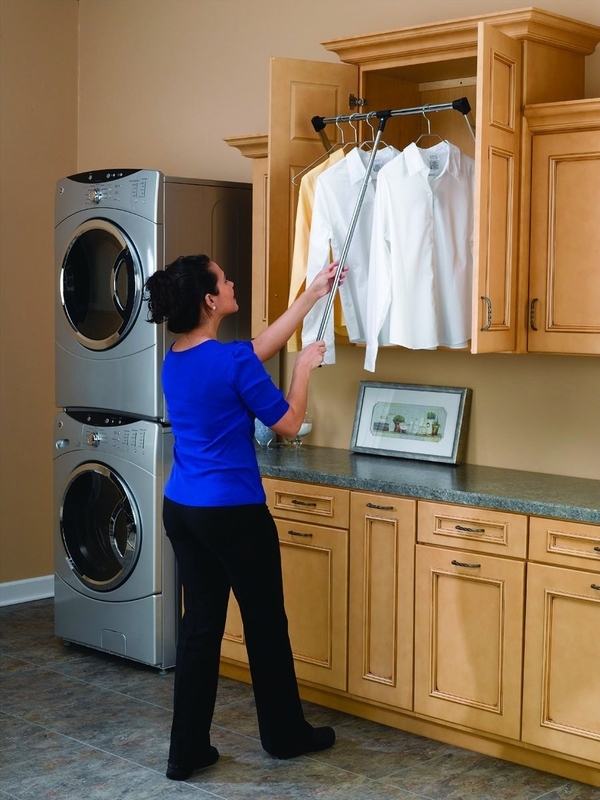 Includes an adjustable rod and mounting hardware. Ideal for handicap accessible applications. Get it from Amazon for $64.76+ (available in three sizes). 4. A set of spice strips for transforming your regular old drawer into a ~custom~ spice drawer where you can organize jars in alphabetical order or by spiciness. Your choice! 5. 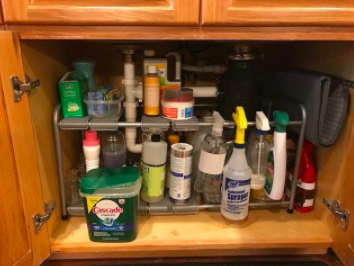 An expandable under-sink kit that can fit around awkward pipes. 6. A pair of magnetic trays to stick in a junk drawer or on top of a metal tool bench to keep small hand tools and fasteners where you want 'em. Made of stainless steel, and measure at 9”x6” and 4”x4”. 7. A tidy scarf organizer that'll easily come out of your closet for speedy ensemble planning. Holds 18 scarves, ties, belts, or shawls, and measures 11.5"x0.5"x9.5". Get it from Amazon for $8.79 (available in six colors). 8. A K-cup organizer with 50 slots and a handle for easily stashing. It just may become the most reliable thing in your morning routine. Get it from Amazon for $11.12. 9. An in-drawer bra organizer to help maintain cup shape in between wears. Aka, your drawer is going to look like one from Victoria's Secret, except the pretty things inside are already yours! Stores as many as 10 bras, depending on style. No installation required. 10. 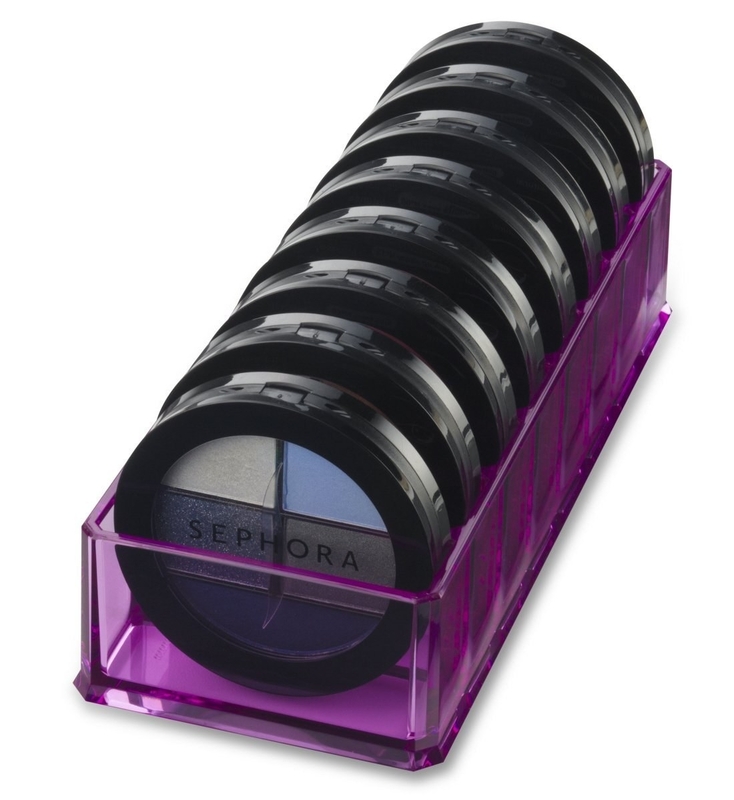 A compact liner holder that'll bring the difference between brown-black and brown to light, lest you make that embarrassing mistake again. Holds up to 26 individual liners and measures at 5"x2.16"x2.16". 11. A tiny valet rod for your closet that'll honestly change your life when it comes to getting dressed every morning. Get it from Amazon for $14.84. 12. A folding trunk organizer to serve as your second (and third and fourth) pair of hands during everyday tasks. Has three sections and measures 23"x14"x12'' with two external pockets. Get it from Amazon for $34.95+ (available in seven color combos). 13. A cosmetics tower fit for vertical or horizontal storage — it won't take up much room, either way. Get it from Amazon for $20.99 (available in three configurations). 14. 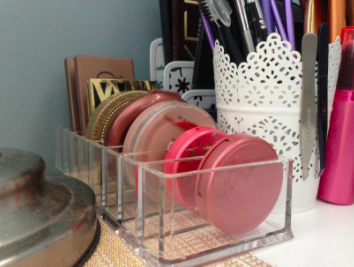 A rotating organizer to help you wear more of the lippies you already own. Measures at 8.6"x3.5"x 3" with .85" inner cubes. 15. 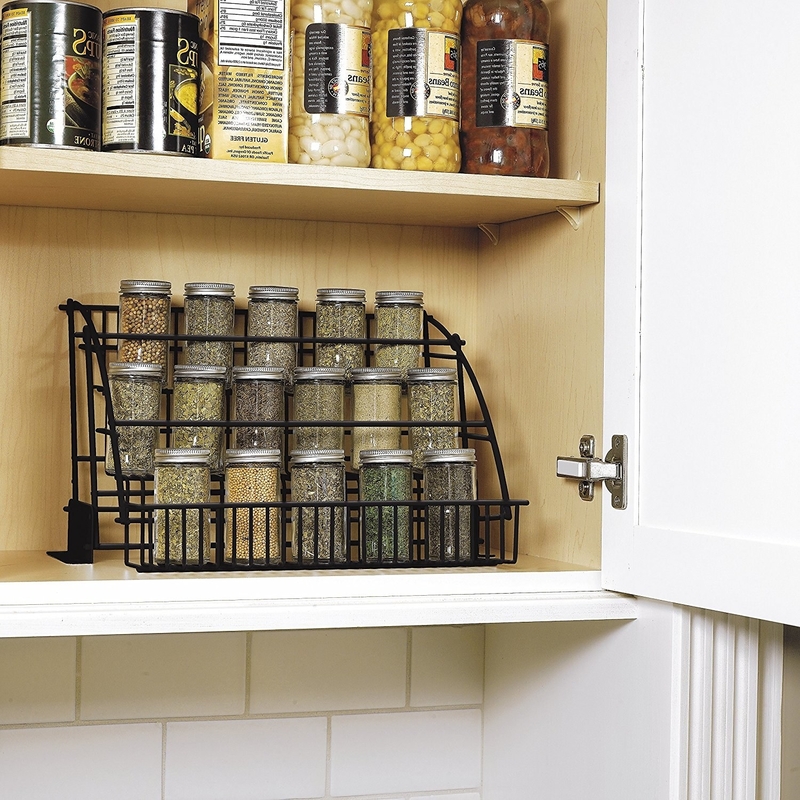 Clear bins that'll tidy up your home in a million different ways. Get a set of four from Amazon for $37.99. Get it from Amazon for $19.99+ (available in three finishes). 17. A four-pack of car-seat hooks to free up some *serious* room in your backseat and floorboards. Can hold up to 30 lbs. per hook. Get them from Amazon for $4.76. 18. 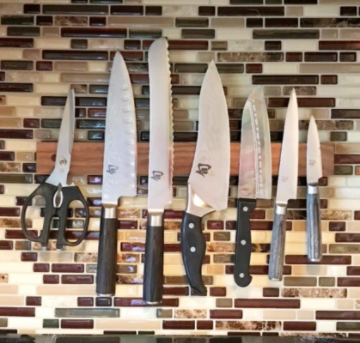 A gorgeous magnetic knife rack that has a wood surface so you don't have to give into the metallic look. Has a continuous magnet and made of all natural–food safe wood. Includes mounting hardware and wood plugs to cover the hardware. This is also great for mounting inside drawers for organizing items like paperclips or bobby pins. Get it from Amazon for $34.95+ (8 lengths and 10 wood types). 19. A spinning cosmetic carousel, which just may be more fun to own than riding on a carousel when you were a kid. Measures at 8.125"x9", can rotate 360 degrees. 20. A genius shoe stacker — it'll double your shelf storage space without hiding your best investments. Get a six-pack from Amazon for $14.99. 21. And a knee-high boot holder to prevent any shaft slump-age on your closet floor. Includes enough to hold five pairs. 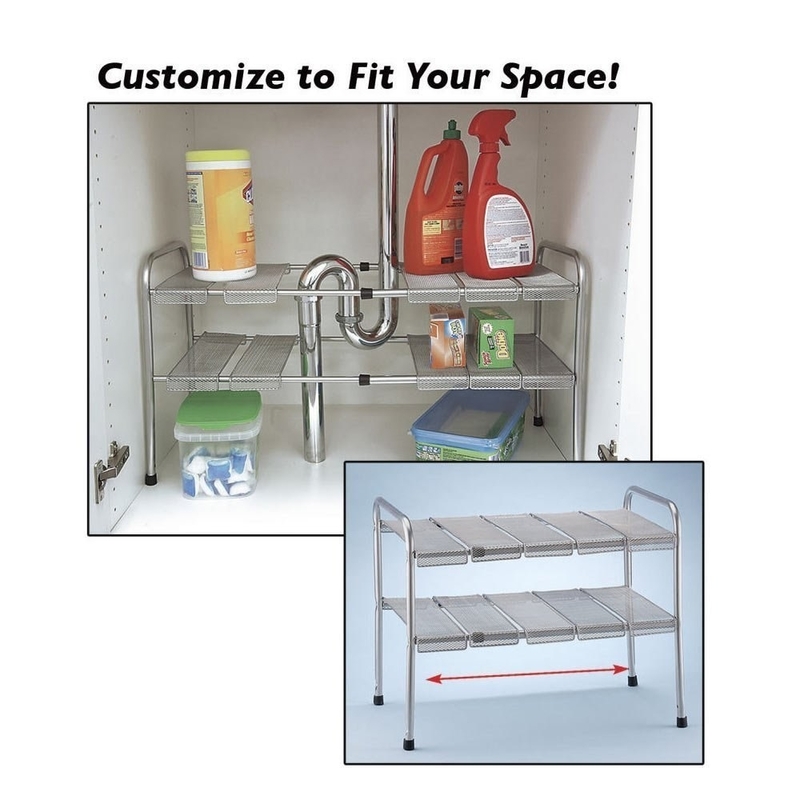 Can store vertically (as shown) or horizontally. Requires no installation. 22. A tea bag organizer that'll lend a glimpse into just how long you've been giving boxes of tea too much kitchen cabinet space. Promising review: "Do I really need a tea bag organizer? That's what I was thinking when I ordered this. And when I took it out of the box. And when I filled the first little bag holder. But as the pile of empty boxes grew larger, I knew the answer was yes, I do need a tea bag organizer. I was using a whole shelf and a half of jumbled tea boxes which I had to sift through to look for a specific tea. In the end, I think this held about eight or nine boxes of tea bags (I crammed some of them). I am so happy that I got this!" —Sarah C.
23. A beauty compact organizer so you can take a solid gander at the lineup for consideration today. Get it from Amazon for $12.50 . 24. An easy-peasy pan organizer to do the hard work of holding Pyrex dishes that you're always puzzled about where to put. 25. 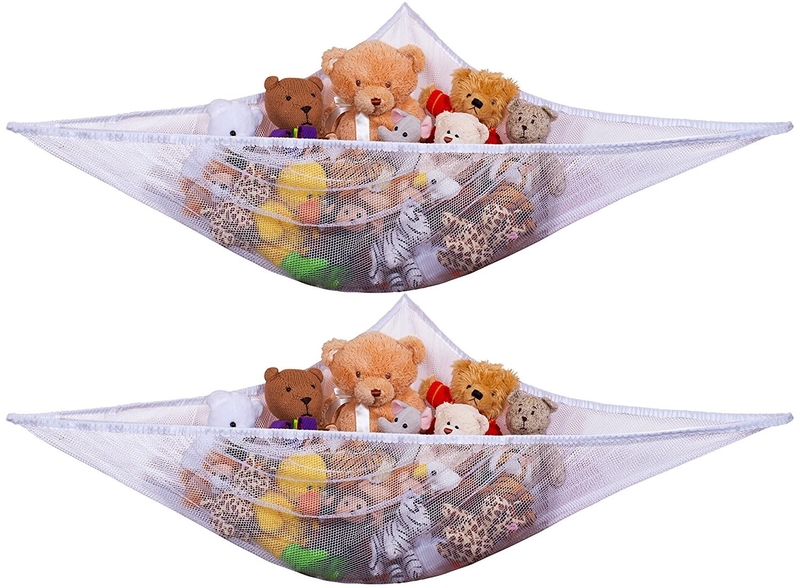 A pair of storage hammocks that you'll initially scoff at, but then you'll realize your kids will actually be into them and they're pretty low-key IRL. 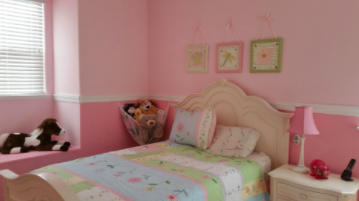 Can expand up to 5.5' and hold as many as 30 stuffed animals. Get a two-pack from Amazon for $12.99. 26. A sturdy, expandable shelf for buying you some more space without the costly renovation. Measures at 15.75"x9.4"x5.7" and can expand up to 30". Get it from Amazon for $23.09. 27. A spool-shaped sewing station so everything you need for your current project will be right where you need it. Stoneware construction with removable lid for bobbin storage, a scissors hole, and pincushion. Get it from Uncommon Goods for $58. 28. A heavy-duty pan organizer fit to hold the weight of your favorite cast-iron pans. Yes, panS! Five-tier pan has a larger tier on the bottom to accommodate larger pans. Requires no installation. 29. Soft organizers you can easily nestle into dresser drawers because you've had ENOUGH when it comes to finding a clean pair of black socks. 30. A behind-the-door cabinet for the room where you swear you have absolutely no more space. Get it from Amazon for $149.99 (available in two colors, four types). 31. An adjustable wrap stand to gather your food-saving heroes into a super-helpful assembly. Made of dishwasher-safe silicone. Includes a non-slip basemat and 15 reposition-able Divitz in three sizes.